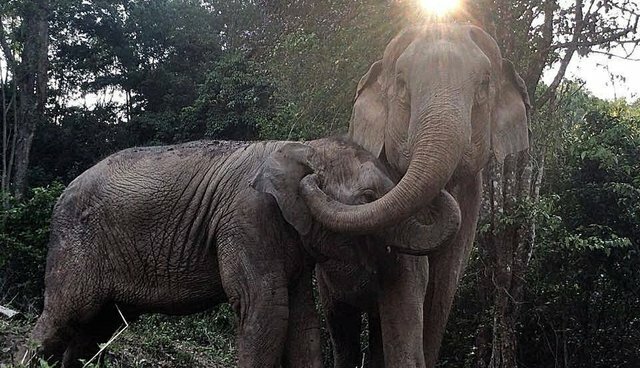 A kidnapped elephant calf named Me-Bai is once again safe and free, reunited with her mother after years of exploitation in captivity. Me-Bai's heartbreaking story began when she was just a few years old, torn away from her doting parent Mae Yui and forced into a life of slavery. The helpless calf was subjected to a "training crush," a ritual where elephants are often shackled and beaten until their spirit is broken. 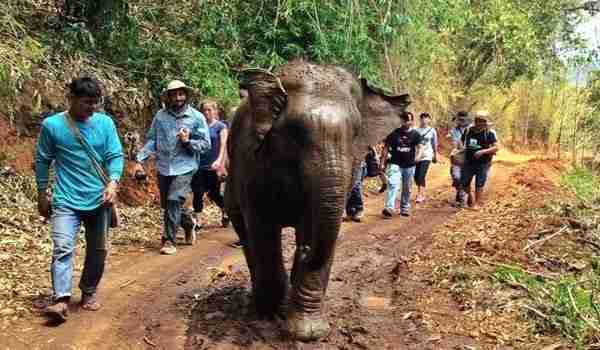 Then she was sold off to a camp to give paying customers rides as part of Thailand's elephant tourism industry. "Imagine her many nights filled with panic and fear, a child alone, injured and confused; for three and half years she stood in the rain and the sun without her mother; for three and a half years she entertained the human need for subservience," wrote sanctuary founder Lek Chailert. 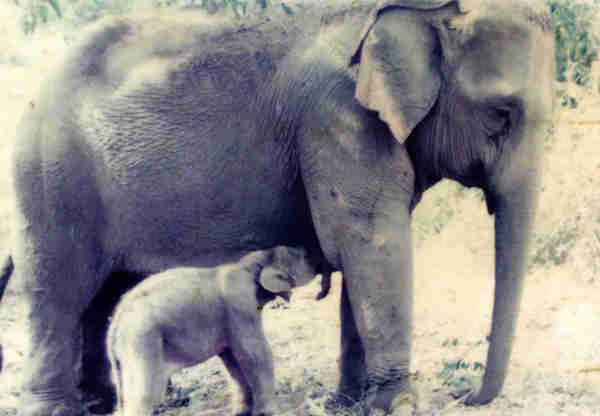 The emotional pain of being separated from her mother proved even more profound than the abuses Me-Bai suffered - and it made her a less than ideal captive. Three years into her life as a slave, the depressed calf stopped eating normally, becoming so thin that she was no longer of value to her captors. Fortunately, Me-Bai was granted an early retirement. 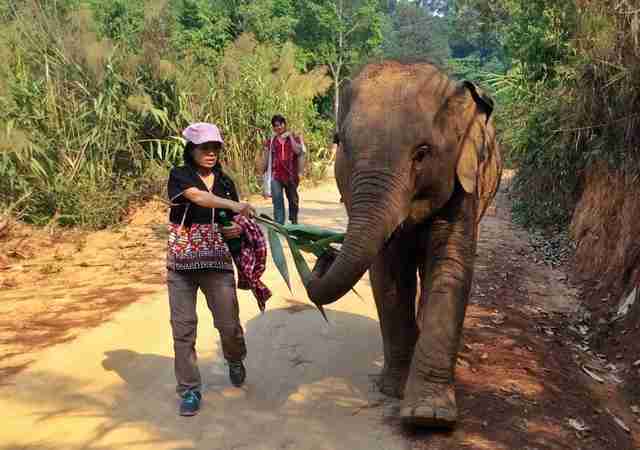 She was given over to rescuers from Elephant Nature Park, a sanctuary for pachyderms, to begin the process of healing after her years of suffering. As sanctuary staff began to nurse Me-Bai back to good physical health, they also set about to rectify the injustice of her past. Chailert was able to track down Mae Yui at another tourist camp more than 100 kilometers away. 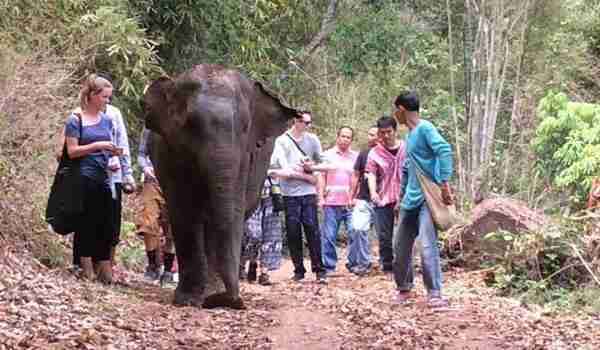 She convinced the elephant's owners to allow for a visit with her kidnapped calf. With that, Me-Bai and her caretakers began the long trek on foot, all to help mend a bond which for too long had been broken. Me-Bai, of course, had no way of knowing that a reunion had been arranged - but after four days of hiking, the moment finally came for her to see her mother once again. "When Mae Yui and MeBai met, it seemed both of them were shocked and they held quiet, silent for half an hour," Chailert wrote. 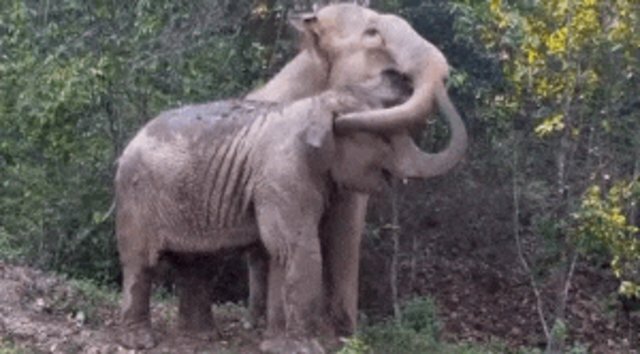 "And then they began to talk, MeBai and her mother joining trunks, hugging each other and talking non-stop, three and half years of catching up." Despite their years apart, the ties of love between mother and child have been quick to rejoin. 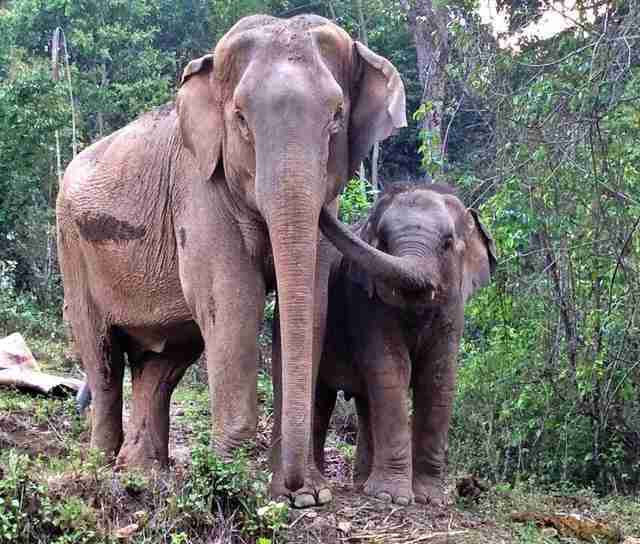 "Now [Me-Bai] enjoys the companionship of her mother - she feels like the little baby again," wrote Chailert. "She feels safe when she sleeps because her mother stands over her. She sleeps deeply and snores loud in the jungle. [Sometimes] she wakes up and tries to drink milk from her mother's breast. It is such a beautiful moment."